A green economy strategy can strengthen the UK economy by overcoming key structural weaknesses, particularly under-investment in infrastructure and under-performance in innovation. A credible, long-term strategy, supported by environmental tax reform, can thus deliver a more durable recovery while contributing to climate stability, resource security and better environmental quality. Government should take a more proactive, strategic approach to driving green innovation. A green industrial strategy can help to secure comparative advantage in key sectors and areas of technology – the UK still has the opportunity to be a leader in many of these areas, but other countries are already seizing the initiative. 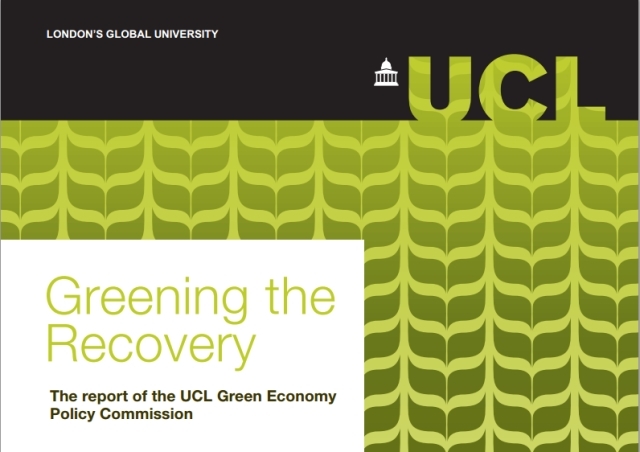 The UCL Green Economy Policy Commission (UCL GEPC) included a diverse group of academics with expertise in economics, the built environment, infrastructure finance, political science, innovation, and resource efficiency. The UCL GEPC clearly believes that a green economy can help drive a competitive advantage in innovation and technology which is necessary for the long term success of the UK economy. The report also highlights the fact that the very fragility of the economic recovery provides a case for making this investment now. Resource costs are low and the benefits of directed investment in infrastructure and innovation are high. In a world where other countries are moving towards greener innovation, the UK should act to establish and maintain leadership and competitive advantage. This entry was posted in General, Green Business. Bookmark the permalink.